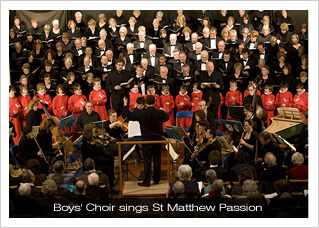 The Boys' Choir of All Saints joined the Northampton Bach Choir and period orchestra Charivari Agréable last Saturday to perform Bach's monumental St Matthew Passion. The concert marked the beginning of a year of celebrations by the Northampton Bach Choir who will reach their 75th anniversary next year - when they will perform Bach's St John Passion, accompanied again by Charivari Agréable; for that performance they will be joined by the Girls' Choir of All Saints. The Boys' Choir will also join the Northampton Bach Choir again, alongside the Men and Choral Scholars on 30 January 2011 to perform Fauré's Requiem with the Royal Philharmonic Orchestra. 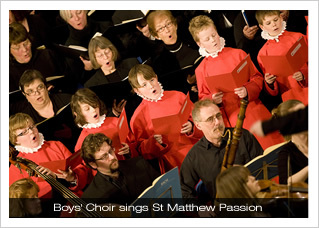 Photographs published by permission of the Northampton Bach Choir (Linda Dawson).